Race for the Galaxy, designed by Thomas Lehmann and published by Rio Grande Games, is one of the greatest Essen 2007 hits. Thomas was already known for many designs including Phoenicia (featured last issue). Thomas was also involved behind the scenes in the developing of San Juan (Spring 2004 GA REPORT) and that is quite evident in this design even if the two games differ. Anyway, Race for the Galaxy is different from his past productions and also marks a real step ahead in his designing career. I think there is no need to spend ink talking about the publishers since Rio Grande Games has produced so many good quality games to be well known by everyone. In the box you will find cards: four action decks in different colors (nine cards each), a deck of planets and technology cards and victory points counters. Race for the Galaxy is fully a card game and you get some of the feelings of a CCG, playing cards turn after turn getting more power and possibilities. 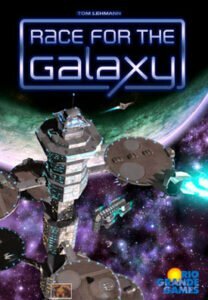 Every player controls one of five space civilizations expanding in the galaxy through the colonization of planets and the developing of technologies. Planets and technologies are represented by cards that also are used for trade goods and money. The game ends at the end of the turn in which one of the players has played 12 cards in front of him (or if the pool of victory points counters is depleted). As in San Juan, if you have to spend money, you are going to discard cards from your hand; resources on the planets are marked with a face-down card displayed below it. Every turn, each player secretly decides which one of the five possible actions he/she is going to execute by playing one of his seven action cards. The possible actions, in the order they will be executed, are Explore, Develop, Settle, Consume and Produce. All the activated phases are then executed by all the players (not only the one who played the card) in a fixed order with a sort of Puerto Rico-like bonus for the one who played the right card. Both Explore and Consume are displayed on two different action cards because they could be activated with different bonuses. In the two player game, every player is going to play two action cards and a second Settle and Develop card is added making the decision of which two out of nine your are going to play. It is important to note that not all the actions will be executed every turn and that it will be possible (and is actually quite common) that more than one player will choose the same action. This part of the game, the decision about which action card play in the turn, is where all the interaction between players lay, trying to determine which actions other players are going to activate so you can optimize your turn. If we need to find a fault in this game, it is the lack of direct interaction between players. The rules assume that every civilization is expanding in an unlimited zone of space so that there is no competition for the same planets so no alliances, no trades, no epic space battles but just a slow process of expansion in a quiet galaxy! To understand the game, we need to go through the actions one by one. First there is Exploration, the standard way for players to get new cards. Two new cards are drawn from the deck but only one is held in hand. The two exploration action cards allow a player to take seven cards instead of the usual two (always keeping one) or just take three and keep two. You can imagine the first simulating a deep space exploration in the aim of finding a particular planet, the second like a detailed scan of a particular sector. The second phase is Develop, where civilizations are going to acquire new technologies. Most techs give players special benefits during the game; the most expensive ones also give a lot of points in the final score. To play a technology card you have to spend money (discard cards). The cost varies from 1 to 6 with a discount of 1 if you have played the Develop action card. Since you can never accumulate more than 10 cards at the end of each turn, it is quite clear that developing the six high cost technologies is a big investment. On the other hand, it is not easy to win the game without at least one of these special victory point cards The tech 6 cards are really different and to get high bonuses, you usually have to follow a particular strategy; it is important in that way to think ahead remembering that you can’t be sure to be able to get and play a particular 6 tech card until you have it in your hand. The third phase is Settle when new planets are colonized. Usually the costs range from 1 to 6 and every planet has particular and special abilities and sometimes the possibility to produce goods. The planets are divided in two big categories: red planets and black planets. You colonize the black ones spending money, like developing new techs, but to colonize a red planet, you need to conquer, without spending any cards but with enough military power. You start with 0, 1 or 2 military power depending on the civilization you are going to use. Some technologies and some planets improve this value. The military power you need to conquer a planet varies from 1 to 7 (for the high point valued Rebel Outpost!). Usually, if you decide to follow the military way, you have to concentrate on developing military technologies and conquering planets that give you more military power. Sometimes it could happen that a lucky sequence of cards in the beginning allows a player traveling the military way to rapidly become a powerful military force conquering at no cost new planets every turn leading the game to a quick end. The military way could be a good strategy to follow if you have the right cards and the right civilizations. The fourth phase is Consume where victory points are awarded and trades resolved. Trading means discard one (and only one) of your goods from one of your planets getting from two to five cards depending on the type of good. This is the most efficient way to get new cards/money in your hand, Then all the other goods you have are converted to victory points as long as you have planets and technologies allowing you to do that. A good production/consume engine could easily bring 4-6 points every turn. The conversion of goods to victory points is activated for all but trade is only available by playing the right action card. The second card activating the Consume phase lets the player collect exactly the double amount of victory points. The final phase is Produce where all planets capable of production and without goods produce. Some planets are special, in the sense that they come in play with a good but do not produce so often. There are four different type of goods; they change in trade value and also in the way they are used in the game thanks to the different powers activated by planets and technologies. The game ends at the end of the turn when all victory counters are been awarded or when one of the players has 12 cards displayed in planets and technologies. The winner is the player with the most victory points after totaling VP gained by planets, technologies, special 6 tech card bonuses and victory counters. What the game lacks, I think, is a bit of interaction between players and the possibility to play with more than 4. It is difficult to stop a player going to win because you have no possibility to interfere with his actions and that sometimes ruins part of the fun. Also, sometimes you have the impression that the game ends just when you have wisely raised your victory points engine and are going to use it at full power.